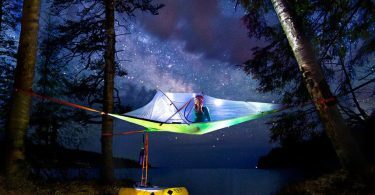 Camping fans for tents should be both portable and battery powered. Many campers who want to use a fan for tent camping are also looking for the fans to be easy to pack, move a lot of air, and make some white noise to help them sleep. We have researched all the tent fan options for camping and recommend the O2COOL 10-Inch Battery Operated Fan with Adapter as the best fan for tent camping. In addition to our best tent fan pick, we have identified some other tent fans for specific camping fan needs. 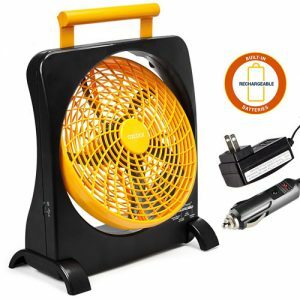 The O2Cool 10″ Battery Operated Fan with Adapter is the best camping tent fan for sale and should be your top pick especially if you’re looking for a portable tent fan that is battery operated but can move a lot of air. This tent fan is also just loud enough to provide some nice white noise if you are used to sleeping with some background noise. This particular model is a 10-inch model that uses 6 large D-size batteries so it is mostly going to be used for family and car camping. It’s not for backpacking obviously. You’ll also want to bring along extra batteries if your camping trip is longer than 3 days. We recommend using the EBL D Cells 10000mAh Rechargeable Batteries with Battery Charger and getting an extra 8 batteries. Additional features include: Dual Power sources: Plug-in with the AC adapter (included) or use 6-D batteries (not included). Powerful 2 speed 10-inch blade. Convenient built-in handle. Stable horseshoe base. Tilts for directional air flow. Compact folding design makes it great for travel; easy to carry and store. Battery life (varies by type of batteries used) High speed-20hrs/Low speed-53hrs. The O2Cool 10″ Portable Camping Fan with Lights is very similar to our top pick in quality and function. In addition to great air movement, good background noise, and portability, this fan adds lights and a base that pivots independently for stability on uneven surfaces. Many people don’t need the extra light feature and it adds cost, so we are reviewing this model as a runner-up. In addition, this model does not include the power adapter which we believe is important when owners want to use the fan for other uses besides inside a tent. Just like our top pick, this particular model is a 10-inch model that uses 6 large D-size batteries so it is mostly going to be used for family and car camping. It’s not for backpacking obviously. You’ll also want to bring along extra batteries if your camping trip is longer than 3 days. We recommend using the EBL D Cells 10000mAh Rechargeable Batteries with Battery Charger and getting an extra 8 batteries. Additional features include: Dual Power sources: Plug-in with the AC adapter (not included) or use 6-D batteries (not included). Powerful 2 speed 10-inch blade. Convenient built-in handle. Stable horseshoe base. Tilts for directional air flow. Compact folding design makes it great for travel; easy to carry and store. Battery life (varies by type of batteries used) High speed-20hrs/Low speed-53hrs. If you prefer a fan that hangs from the ceiling of your tent and blows cool air down on you, the Image Portable Tent Ceiling Fan is your best option. This tent fan also includes a light so if you don’t have good places to put both a light and a fan in your tent, this is a great solution because you can hang it in the middle of the tent. This particular model uses 2 large D-size batteries so it is mostly going to be used for family and car camping. Even this tent fan is too big and bulky for backpacking. You’ll also want to bring along extra batteries if your camping trip is longer than 3 days. We recommend using the EBL D Cells 10000mAh Rechargeable Batteries with Battery Charger which includes 4 batteries. Additional features include: High speed and low speed two modes. 360 degree adjustable lighting angle. 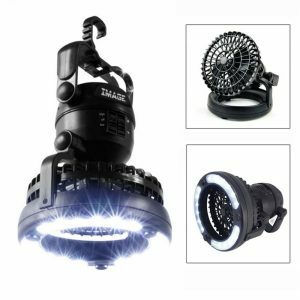 A very bright LED light, which should be kept in mind if you like a warmer light for the outdoors. Battery life (varies by type of batteries used) High speed-20hrs/Low speed-30hrs. The LED light will last alone for about 40 hours. 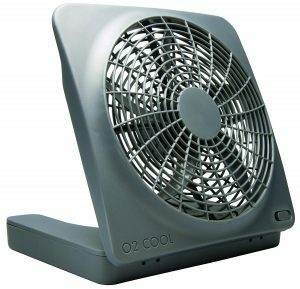 The O2Cool 10″ Portable tilting fan is on our list because of how powerful yet lightweight it is. We recommend this fan if you’re looking for a travel fan not just for the outdoors because it is so versatile. 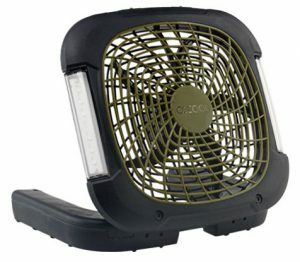 While it works great in a tent, it also works as an emergency fan, inside a truck or car, or for regular travel. This particular model is a 10-inch model that uses includes 8 large rechargeable D-size batteries so it is mostly going to be used for family and car camping. It’s not for backpacking obviously. You’ll also want to bring along extra batteries if your camping trip is longer than 3 days. We recommend using the EBL D Cells 10000mAh Rechargeable Batteries with Battery Charger and getting an extra 4 batteries. Additional features include: Smart Power® technology – Fan automatically selects lowest cost power option. Multiple Power sources: Plug-in with the AC or DC adapters (included), use 8 D-Cell batteries (not included), or use built-in rechargeable batteries. Powerful 2 speed 10-inch blade. USB Power Port for charging your cell phone or other mobile devices. Convenient flip-up handle. Stable base with stabilizing feet. Tilts for directional air flow. The O2Cool 5″ Portable clip fan is the most portable fan to make our list. 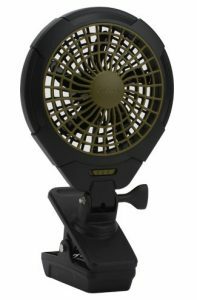 We recommend this fan if you’re looking for a tent fan that is easier to pack than the larger 10″ models. If you are a backpacker and are willing to carry a little more weight while backpacking in the heat,m this might be an acceptable option as well. This particular model is a less expensive, 5-inch model that uses includes 4 small AA-size batteries making it small enough to fit in an overnight bag. You will still want to bring along extra batteries if your camping trip is longer than 3 days. We recommend using the Panasonic Ni-MH Battery Charger Pack with 4 AA Rechargeable Batteries and getting an extra 4 batteries. Additional features include: Heavy-duty clip allows you to use fan almost anywhere. Fan head rotates and pivots to direct airflow where needed. Powerful two-speed fan offers quiet cooling. New rugged design makes it great for camping and being outdoors.